MPG-o-Matic 2013 Chevrolet Malibu Eco Review Summary: The 2013 Chevy Malibu Eco dukes it out in the midsize sedan segment with the Honda Accord, Ford Fusion, Toyota Camry, and Hyundai Sonata. 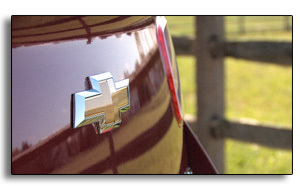 General Motors chose to cast aside the flashy hybrid emblem of the Eco’s predecessor, in favor of a small green badge. The new Malibu Eco swaps in a 2.4-liter inline four and lithium-ion battery powered electric motor in place of the older Hybrid’s 3.6-liter V6 and NiMH battery pack. We found the new model to be quieter, faster, more fuel-efficient, and more refined. The 2013 Chevy Malibu Eco is powered by a Direct Injected VVT 2.4-liter inline four-cylinder engine with eAssist that produces 182 horsepower (HP) and 171 foot pounds of torque. A six-speed automatic transmission is standard. 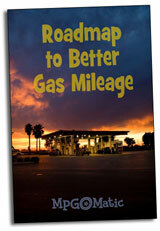 The official fuel economy estimates for the 2013 Chevy Malibu Eco are 25 city / 37 highway miles per gallon (MPG). We covered over 400 miles in our Crystal Red Tintcoat review unit and squeaked by the official mileage estimates on the open road, with an average of 40.5 MPG on the Interstate highway and 31.8 MPG combined with spring temperatures ranging from the forties through the fifties. Interstate highway testing temperatures were in the low-to-mid fifties. 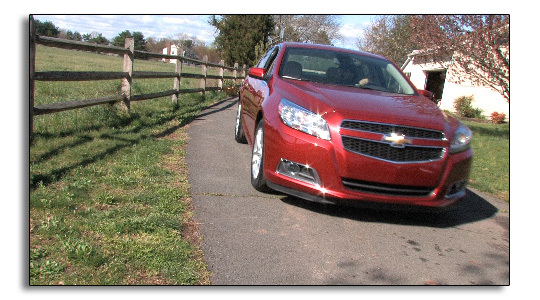 Our Malibu Eco 2SA test vehicle was equipped with the standard 17-inch alloy wheels, clad with low-rolling resistance Goodyear Assurance Fuel Max 225/55R17 all-season tires, and was delivered with just over 1000 miles on the odometer. Editor’s Note: Both the Malibu and Verano are being marketed as quiet cars, but they are on different platforms. The Malibu and Regal are built on the Epsilon II platform. The Cruze and Verano are on the﻿ Delta II platform. The eAssist mild hybrid system provides extra oomph under acceleration, along with stop/start functionality. Come to a full stop, and the Malibu Eco’s gasoline engine will shut down to conserve fuel. When you lift your foot off the brake pedal, the engine whirs to life. GM’s eAssist is more like Honda’s IMA system, rather than the Toyota or Ford hybrid systems. While the Malibu Eco’s electric motor provides assistance during some acceleration events, you can’t﻿ crawl the way you can with a Toyota Prius or Ford Fusion Hybrid. The Malibu’s dashboard is undeniably bold – from the hybrid graphic display through the dramatic swooping design. The 2SA trim level includes fog lamps, leather wrapped steering wheel and shift knob, and an eight-way power driver’s seat. Our tester was equipped with the Leather option package, with three-way heated front seats. Four-way power lumbar support is included for both front buckets. The nine-speaker, 250-watt Pioneer audio system features a seven-inch touchscreen LCD (which flips up to reveal a hidden storage compartment), complete with satellite radio, iPod integration, and rear backup camera. Six months of On Star service is included. Our test unit was not equipped with the optional conventional Navigation package, which provides driver seat memory presets (although it requires the Leather package). Handsfree Bluetooth is standard. A power sunroof is offered as a standalone option. There’s a twelve-volt outlet at the base of the dash, and another inside the center console next to the USB input. The Malibu Eco’s rear seats provides 37.5 inches of headroom and 36.8 inches of legroom, along with a fold-down center armrest. The Eco’s trunk allows for just 13.2 cubic feet of cargo area, a good bit less than the Malibu LS, LT, and LTZ. The lithium-ion battery pack eats up that space, leaving room for only a driver’s side fold-down rear seat passthrough. All-in-all, the 2013 Chevy Malibu Eco delivers a quiet and refined ride with a mild hybrid system that delivers solid fuel economy numbers for a mid-size sedan. While it’s evolved to become a formidable competitor to the likes of the Honda Accord and Toyota Camry, the Malibu needs a fuel-efficient clean diesel engine under the hood to really set itself apart from the flock of mid-size sedans. You cannot call the Malibu a cousin to the Verano. Sorry, they are completely different platforms with two entirely different audiences. @Kevin – Hey, how about “second cousin?” 🙂 Did I mention that they shared platforms? As far as different audiences go, I’m not sure I buy that, at all. Who’s to say who buys what? A marketing executive? Folks will shop the Malibu against a slew of sedans.